Rendezvous in Monte Carlo is one of two limited edition baked eye shadow quads from Laura Mercier's New Attitude Collection for Summer 2014. This is the one with the softer, more neutral colors, while Summer In St. Tropez brings a blast of riviera colors. While my advice regarding Summer In St. Tropez would be to only wear one color at a time (that's how I use all my other Laura Mercier baked eye shadows, actually), with Rendezvous in Monte Carlo you can actually combine almost any two colors together, since the finishes go from matte to intense sheen. -opalescent white, high shimmer (this is the weakest link in the quad. Would work better as a face highlighter than anywhere around the eyes. Use with caution). Many times baked eye shadows benefit from use with a damp brush to intensify the colors and/or control glitter fallout. 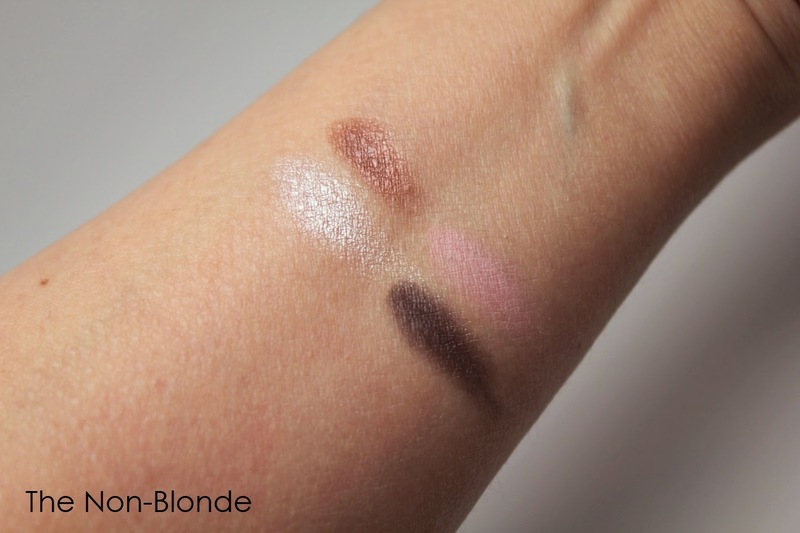 But this Laura Mercier quad is so of such an impressive quality that the pigments are already in full capacity when used dry (as seen in the swatch) and there's very little difference when used damp (not enough to show in photos). Fallout is also minimal, so that's not an issue, either. 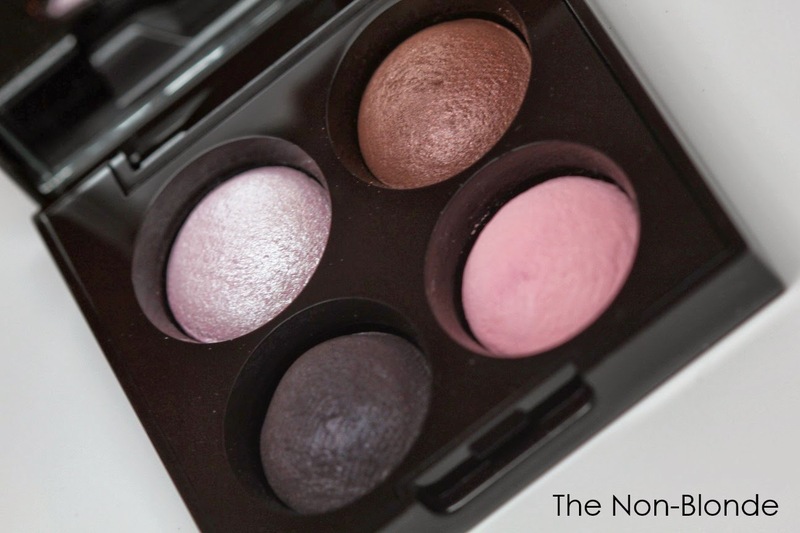 The one color here that gains extra complexity is the blackish one, because it gets an interesting almost purple cast under a certain light, and can also be used as an eyeliner this way, but it's by no means necessary. Bottom Line: I'll go on that Rendezvous, if only for the two darker colors. 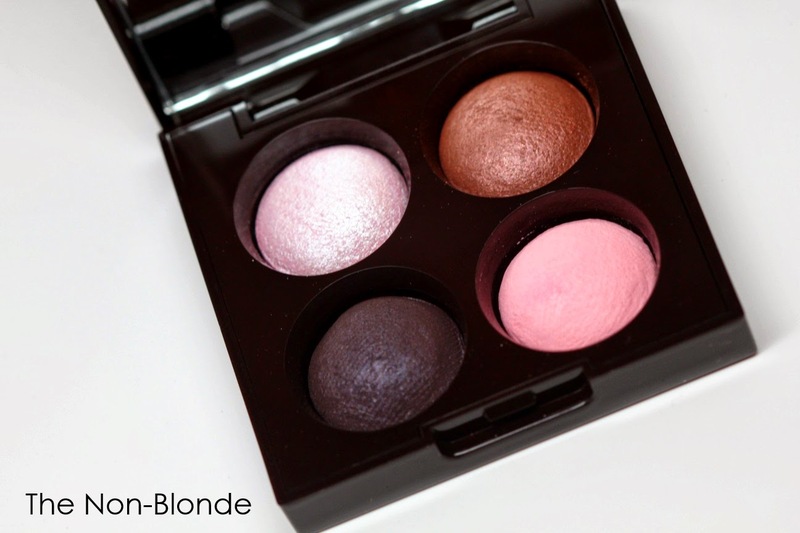 Laura Mercier Rendezvous in Monte Carlo Baked Eye Colour Quad New Attitude Collection ($44) is available at the counters and online. The product for this review was a press sample. When I saw your previews on the 21st, I thought Rendezvous in Monte Carlo was just so-so; but now that I see your swatches, I think I can use all four colors (being careful with the white?). Hope you evaluate Summer in St. Tropez soon, so I can decide which one or both to buy. Now, it's the torture of waiting for them to arrive online. Thanks, also, for explaining about how to use the baked colors...nice to know water isn't necessary! J.E.W. This looks really nice (oh the magical taupes!) but I think this extended winter is making me want to see all tropical colors...and wear them all at the same time! lol I have had enough of cold and snow but I shall show restraint in my makeup.